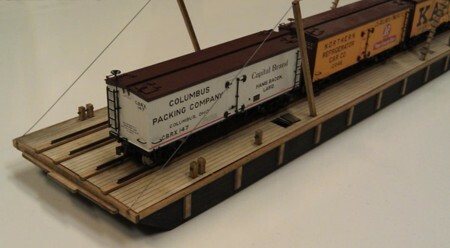 This small transfer barge is based on one used by the Canadian Pacific ca. 1890-1910s. It is typical of the small wood transfer barges used on inland waters, especially in areas where bridges were too expensive to build and maintain, conflicted with heavy river traffic, or subject to damage due to floods and ice. This barge will accommodate a maximum of six 36' cars with the double rail configuration. As with all large wood barges, king posts and hogging cables provided the necessary support. A crude wood ladder provided access to the cable turnbuckles for tension adjustments. Scuttle hatches allowed access into the barge interior for maintenance and the mandatory bilge pumping. 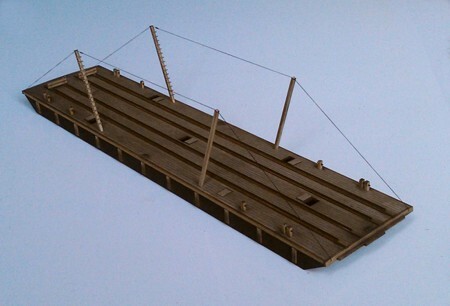 This kit allows the modeler to use their own desired rails and gauge (standard or narrow). Built for double track, a single standard gauge will also work. Rail may be powered by soldering a small phosphor bronze pickup to the rail (makes for an easy connection when the barge is butted up to transfer bridge). Instructions are full color and provided on a CD-ROM.